<ajs6f> acoburn: Sure. But that's not it's purpose, and there are better ways to do it. How does Cassandra help me with a 3TB data file? <ajs6f> acoburn: "it's not good at blob storage" gives the game away. acoburn: I think we are still looking for different things. <ajs6f> acoburn: Yes. Why would that be a bad thing? Einstein told us that it's a basic feature of reality. acoburn: I want locality of reference as a _postitive quality_. <ajs6f> acoburn: Cassandra is not a K-V system. <acoburn> ajs6f: how is it not a K-V store? <ajs6f> acoburn: But partition key is also responsbile for sorting, for example. The point is that these different pieces of data structure are not opaque to the system, not at all. Using them in different ways is going to have massively different effects. acoburn: We should just pick a distributed filesystem, an RDF API to use internally, and roll. awoods: The Fedora API is the least interesting thing in the mix. <ajs6f> acoburn: But if you don't _want_ to do the kinds of unoin-graph-centric things that I want to do, and/or no one is _asking_ you to do those things, then you defintely don't want to invest it making them possible, cause it will be very expensive. I admit that frankly. <ajs6f> acoburn: Horribly, hellishly, Hadoopishly difficult. <ajs6f> acoburn: That's the kind of blank-faced obstructionism I expect from ajs6f, not a mature person like you. <awoods> acoburn: you should make your txn objects more vocal... they seem to have been lost in the noise. <awoods> acoburn: good to know. thanks. acoburn: But this is all a side note. Neither Cassandra nor Hadoop give much help her either. I'm still willing to claim that a bunch of RDF files on a dstributed filesystem is a perfectly viable backend. acoburn: _IF_ you don't want to operate on the union gaph as part of your core services, and are willing to contract that out to asynch follower gear. <ajs6f> acoburn: You mean atomicity? <ajs6f> acoburn: As long as people are making requests via the Fedora API, atomicity comes from there. If they aren't, it's not Fedora's prolem. acoburn: Oh, wait, he moved it. Fooey. acoburn: Streamy. The state of a graph at any given time t = the integral over time from 0 to t of the record. <ajs6f> acoburn: It would change the thinking as you say, but only inside the running process. The persistence still has to write down bits. <ajs6f> acoburn: It barely uses the CPU. acoburn: Well, that may change with the advent of API-X. <ajs6f> acoburn: I've been pushing them in that direction. <ajs6f> acoburn: Looks like NFS where you pay per bit, no? <ajs6f> acoburn: Of whom perhaps thrity percent will have any real sense of what that phrase means. <ajs6f> acoburn: Do you want to try doing some design for this "files on a filesystem" thing? acoburn: I feel like at some point we have to go in some direction. acoburn: And we are implementing fcrepo-kernel-api? <acoburn> ajs6f: for both the properties _and_ the binaries? <ajs6f> acoburn: What, for both? The filesystem, for both? acoburn: Meaning, is there apparatus to make JClouds look like afilesystem? <ajs6f> acoburn: Yeah, but I eamn the other way around. <ajs6f> acoburn: Because of the latency? How is it going to be any much worse than using JClouds directly? <ajs6f> acoburn: Why would we use JClouds for the binaries but put the triples on a local filesystem? We wouldn't we put the triples in 'the cloud" too? Or neither? I know the latency is there. That's why you have indexes. acoburn: I have used S3-hiding filesystems without any problem, but more importantly ^^^. Why are we splitting the storage? <ajs6f> awoods: Why not take off a branch for the release? <awoods> ajs6f: yes, we will do that as well. <ajs6f> awoods: So why wouldn't people be able to continue to work off master? <ajs6f> awoods: But that merge is just version numbers, right? awoods: Merge into release branch/tag, merge into master. <ajs6f> acoburn: Again, that's what indexes are for. Isn't this the same conversation we had to have years ago (I don't think you were involved then) about human-readable persistence vs. machine-useful persistence? acoburn: Well, maybe not quite the same, but related. <ajs6f> awoods: You're taking my advice about Git? FIRST. BIG. MISTAKE. <ajs6f> acoburn: I think most Fedora users see bits. The binaries sans descriptions are usually unintelligible, the description without binaries are just a shell of content. acoburn: That's what the metadata without the bistreams is. <awoods> acoburn: These are the modules that will be in the 4.5.0 release. Sound right? <ajs6f> acoburn: I think we have a good solution to point to already— fcrepo-camel-conquers-the-world. <ajs6f> acoburn: Then Thunderbirds Are Go, and they are flying through JClouds. <ajs6f> acoburn: They are blobs? That's annoying, but not insurmountable. You can add new blobs, right? acoburn: Your IDs are whatever you want, right? <ruebot> ajs6f, acoburn: one thing y'all have me thinking about is how we'll handle objects over 5GB w/r/t blobstorage. for example swift's object limit if 5GB, and anything over that is segemented. <ajs6f> ruebot: Everything has a limit. For example, I can listen to about fifteen second of talk about professional sports, after which I start to segment my attention. <ajs6f> acoburn: Actually, the other things that is nice about the filesystem for everything is that it is a very natural reference implementation. <awoods> acoburn: is fcrepo-karaf in shape for release? <awoods> acoburn: that would be nice. <awoods> ruebot: I wonder if we could collapse the modules that will always be released along with fcrepo4? <awoods> acoburn: those are "labs"
<awoods> acoburn: I do not see why dhlamb would have an issue here. <ruebot> ah, there he is. <ruebot> awoods, acoburn: started adding version numbers to the matrix. we can tweak/update as needed. fcrepo4-exts/fcrepo-java-client#3 (master - 0093d6b : Aaron Coburn): The build passed. <ruebot> awoods, acoburn: now that you've done that, should i add 0.1.1 to the 4.5.0 column for fcrepo-java-client? fcrepo4-exts/fcrepo-java-client#4 (fcrepo-java-client-0.1.1 - b11b4a9 : Aaron Coburn): The build passed. awoods: does it seem like there's anything else to do? <ajs6f> acoburn: Just sit back and wait for the money to roll in. <awoods> acoburn: do you want to publish javadocs on gh-pages? <ajs6f> acoburn; Yes. This isn't about raw performance as much as it is about _predictable_ performance that will be good enough for many people. <ajs6f> acoburn: We repeatedly found that it is hard to predict the behavior of Fedora/MODE in clustering. <ajs6f> acoburn: Then we can roar ahead. Roar. <awoods> acoburn: I am not sure offhand why they are not showing up. <ajs6f> acoburn: Okay, but then we have to impl parent-child containment, right? I have no huge problem with that. We can stick it in a sidecar of "administrative" RDF. <ajs6f> acoburn: How about has(path segments) is always a dir. It contains several RDF sources (in the style we have discussed) and optionally either a bitstream file or a dir of bitstream files (different versions). I think that covers the cases, right? awoods: You have any object to doing this Fedora-on-the-Filesystem thing in fcrepo4-labs? <awoods> ajs6f: no objection at all. It seems like barmintor may have some ideas as well. <ajs6f> awoods: That's what he said to me, the last tie we spoke about it. Maybe he changed his mind. ajs6f: any alt-impl that helps us on that front is, well, helpful. <ajs6f> awoods: "prove out" == "find places where it don't work right"
<awoods> ajs6f: yes. we want to know where our Mode impl has driven the API. <ajs6f> awoods: It has driven it into the ground, if you want to cluster. <awoods> ajs6f: yea, that was pretty neat. <ajs6f> awoods: Hurts, don't it. acoburn: Unless you are thinking about multiple threads between the Kernel API and the filesystem? am incliined to Scala, because for those who know no language other than Java, Scala is going to be less scary that Clojure. <awoods> ajs6f: are you expecting some community contribution? <ajs6f> awoods: Not immediately. But on the off chance of real success, this work could evolve into the reference impl. <ruebot> ...i kinda know it. i use it a bit on my research grant project with apache spark and warcbase. <ajs6f> awoods: And ruebot, also, just volunteered. <ajs6f> ruebot: are you not used to this by now? Welcome to Fedora. <ajs6f> bseeger: Reimplementing Fedora. No, seriously. 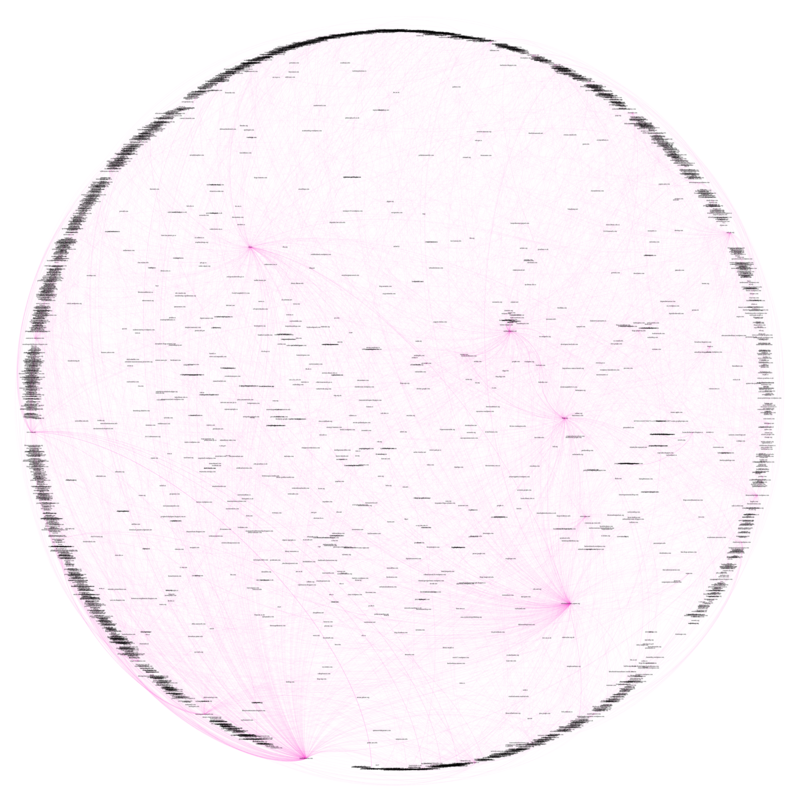 <ruebot> http://ruebot.net/fda-pink.png -- end product of some scala, apache spark, and warcbase work... into gephi. <ajs6f> ruebot: That is a very big graph. acoburn: What did you think of what I wrote ^^^ about directory structure? <ajs6f> acoburn: Okay. In that case, I think we're all wrapped up here. ruebot and bseeger, ready to go ahead and impl this design? I'll be happy to review your PR. Or maybe we'll let dhlamb do that. He hasn't been pulling his weight on this effort. <ajs6f> acoburn: That's what I thought, but you argue above for hashing! <ajs6f> acoburn: I'm not too worried about that level of complexity. And I am worried that without hashing, people will instantly blow out their directory systems. <ajs6f> acoburn: I would rather not use it. I would rather keep triples (pointers) in the individual resources. <ajs6f> acoburn: Unless we get funky and clean up the children _first_. acoburn: But there's still locking. acoburn: You can mv and then still work out of the thing you mv'd, because the thread knows where it put it. <ruebot> awoods: do i need a LICENSE for these JMeter configs? ...should I just throw an Apache License in the git repo for them? * ajs6f is vomiting at the sound of his own joke. acoburn: Except, actually… it might buy you rollback. acoburn: Does that sound reasonable? acoburn: This is all speculative, so I'm not sure how much time I want to spend documenting ether and vapor. fcrepo4-exts/fcrepo-camel#242 (master - abc0ccd : Andrew Woods): The build passed. awoods: meaning, I'd need to just add that file to the gh-pages branch? acoburn: that is what the other modules are doing. acoburn: Eh, I'm going home for the day. Maybe tomorrow. <ruebot> awoods: i added a comment to today's notes like promised. <awoods> ruebot: you are a man of your word. fcrepo4/fcrepo-module-auth-rbacl#41 (rc-4.5.0 - b7dcae2 : Andrew Woods): The build has errored. fcrepo4/fcrepo-module-auth-xacml#91 (rc-4.5.0 - d602312 : Andrew Woods): The build has errored. fcrepo4-exts/fcrepo-transform#19 (rc-4.5.0 - 8a2ec8b : Andrew Woods): The build has errored. fcrepo4-exts/fcrepo-mint#3 (rc-4.5.0 - 72b81e6 : Andrew Woods): The build has errored. fcrepo4-exts/fcrepo-audit#63 (rc-4.5.0 - 1d4361a : Andrew Woods): The build has errored. fcrepo4-exts/fcrepo-webapp-plus#105 (rc-4.5.0 - 1e77300 : Andrew Woods): The build has errored. fcrepo4-exts/fcrepo-mint#4 (rc-4.5.0 - 72b81e6 : Andrew Woods): The build has errored. fcrepo4/fcrepo4#4213 (rc-4.5.0 - de79c1e : Andrew Woods): The build passed.